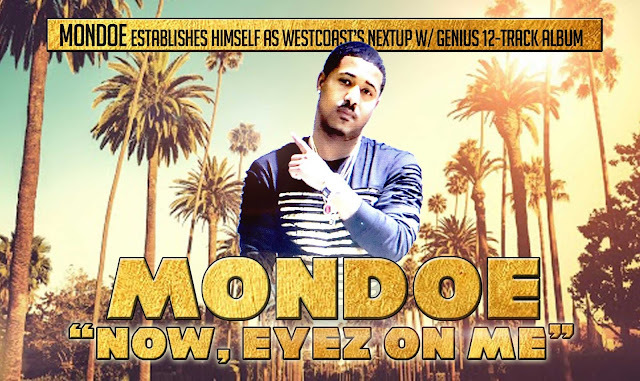 Compton rapper, Mondoe, leaves no one behind and nothing to be desired on his new album, “Now Eyez On Me”. From the seeds planted by NWA and Death Row, then watered by the Kendrick Lamar and his TDE outfit, Mondoe is growing his own tree of hometown glory. And from its fruit, he’s making sure everybody around him eats. For, “Now Eyes On Me” is loaded with guest features; all to which Mondoe perfectly plays host. He is the nucleus of every record, with each sonic and lyrical visitor orbiting smoothly around him. As the cover suggests, this album is a strong ode to his musical inspirations and forefathers; whose spirits fly vibrantly throughout each and every tune. The ghost of Tupac Shakur moves like a poltergeist through his intro-vocals on tracks such as “The City”, ft. A1krashin, and title track, “Now Eyez On Me”. Every other track, albeit seasoned with strong, trap instrumentation, hardly abandon his Californian pride. Whether by synth or bassline, each joint furthers the legacy of that West Coast G-Funk he knows so well. A duo of my favorite records from this album happen to be “Temptation” (ft. Yondo & Iman), and “Money Calling” (ft. Fred Nice). These tracks bolster powerful R&B inflections, and showcase a different aspect of the Los Angeles rapper. Where “Temptation” is slow-burning and risque; “Money Calling” holds an colorful, infallible, club-ready bounce. Through these alternate dimensions of his album, Mondoe displays the diverse influence of his town. “Now Eyez On Me” is his California celebration, full of powerful, radio-ready bangers; showing that the city of Compton will, sooner than later, have a heir to their musical throne.